Precision long-range rifle shooting is hot and shows no signs of cooling down. 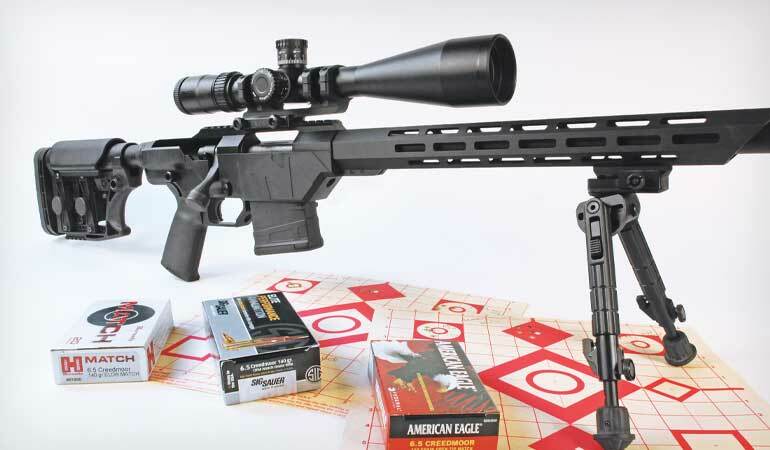 Gun manufacturers have stepped up to offer a wide array of competition-style chassis rifles to meet the demand, but until relatively recently you couldn’t dip your toe in the long-range pool without spending a ton of money. Enter Mossberg’s MVP Precision. It provides the top-flight features found on more expensive rifles at a suggested retail price just a tad over $1,400. It’s not Mossberg’s first chassis gun, but the company thought its initial efforts along those lines could use some tweaking. The MVP action’s claim to fame is its ability to use semiauto magazines. For .223 and other AR-15-compatible cartridges, the MVP’s bolt employs a small lever at the front of the bolt that catches the rear of a cartridge to push it out of an AR-15 magazine. 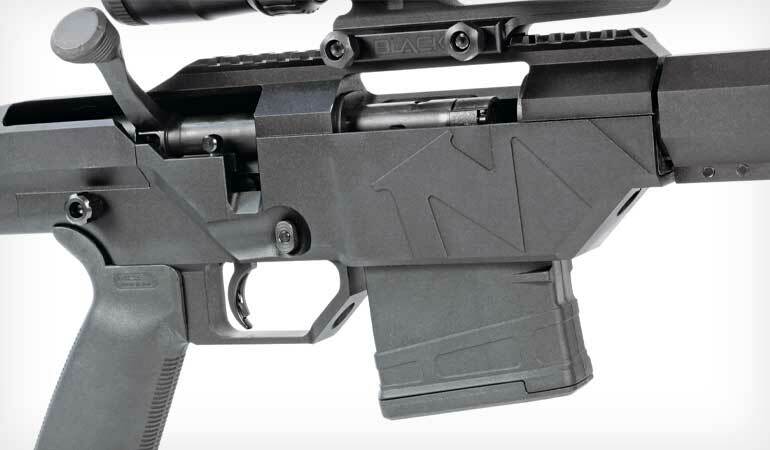 Mossberg redesigned the rifle’s chassis, and it’s a handsome, functional piece of engineering. That’s the Drop Push. On .308 and other AR-10-compatible cartridges, instead of the hinged lever the Dual Push design features a pair of protrusions machined into the bolt head. These accomplish the same mission as the Drop Push’s lever, and it’s the bolt you’ll find on the MVP Precision. The rifle is currently offered in 6.5 Creedmoor and .308 Win. In addition to the rifle’s low cost, the fact that it feeds from AR magazines cuts the shooter’s costs because AR mags are so widely available. You can pay as little as $15 for one, and they can be had in a variety of materials, configurations and capacities. The MVP Precision also accepts M1A/M14 mags. While the selection here is not quite as great, you can find them as cheap as $10. 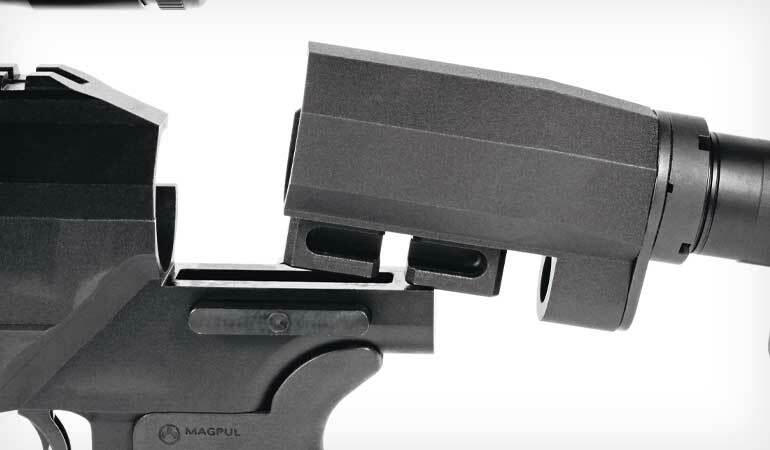 The MVP Precision ships with a 10-round PMag LR/SR from Magpul. I’ll get back to the bolt and other aspects of the action in a bit. What really sets this rifle apart is the excellent furniture, starting with a new Mossberg-designed fore-end. It’s slim and nicely executed with M-Lok slots. In addition to the typical 12-, six-, nine- and three-o’clock slot positions, there are slots at two, 10, five and seven o’clock. That’s a lot of mounting options for accessories. The Dual Push bolt allows the gun to use AR-10 and M14/M1A magazines. 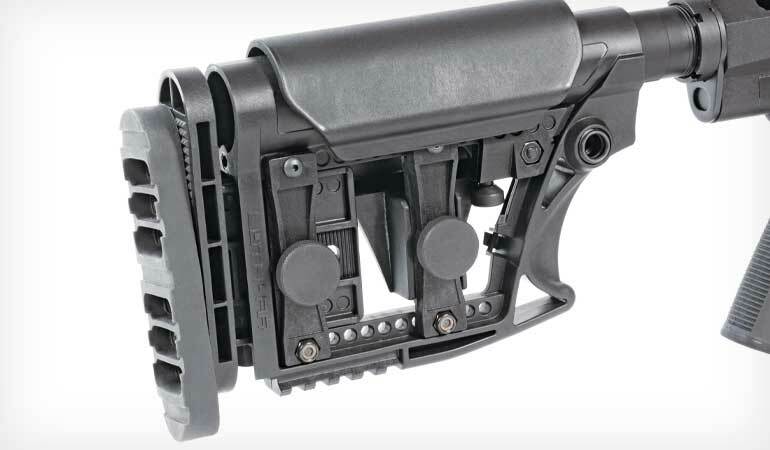 While an M-Lok QD pocket comes installed on the fore-end, I do think Mossberg should also provide an M-Lok rail section so shooters can mount a standard bipod to the gun right out of the box. But I understand not including a rail section keeps costs down, and M-Lok has become so popular there are dedicated M-Lok bipods and other accessories that negate the need for a rail section. But still. The buttstock is the MBA-3 made by Luth-AR and sports plenty of adjustments to tailor the rifle to the shooter. Two thumbscrews provide cheekpiece height and length-of-pull adjustments, and the stock’s length of pull can also be adjusted via the six positions on the buffer tube. I fitted the stock with the buffer tube first and then made little tweaks with the thumbscrew. The cheekpiece can also be moved forward or backward by turning out an Allen-head screw at the base and repositioning the cheekpiece unit in a different hole. Backing out two screws in the buttpad allows you to change the cast. If you take the screws all the way out, you can also lower (but not raise) the buttpad by reattaching the screws in different slots. Two QD pockets are located on either side of the front of the stock. The stock is easily removed by turning a thumbscrew on the right side and pushing in to disengage a block that fits into slotted “feet” at the front of the buffer tube. Mossberg designers came up with a pretty cool way to remove the stock. The shroud interface at the front of the buffer tube has a slot for bolt travel at 11 o’clock, and at the bottom is a pair of slotted “feet” that fit into the rear of the gun’s chassis. To remove the stock for cleaning or transport, simply loosen a screw in the right side of the chassis and push. This disengages a block that fits into the slots in the feet and allows you to remove the stock. The grip is a Magpul MOE+ with the de rigueur compartment to store things. It’s a comfy grip, and I liked shooting it, but with this AR-type design you can of course swap it out for another grip if you want. The redesigned chassis looks sporty, with a partial, stylized “M” on the right side and “Mossberg” on the left. The front is cut at an angle, and the right side features an AR-style magazine release. Up top you’ll find the 20-m.o.a. rail Blazek mentioned, and it provides seven inches of real estate for scope mounting. Other than the bolt’s Dual Push feature, it’s your basic two-lug bolt with a sliding extractor cut into the right lug and a plunger ejector. It glides smoothly in the receiver tube and opens and closes easily. The one-piece bolt has a scalloped handle. I wasn’t a big fan of it because in long shooting sessions the fairly sharp edge caused some discomfort to the middle finger of my shooting hand. It could just be the way I grasp and operate a bolt and may not be an issue for everyone. I think Mossberg’s Lightning Bolt Action trigger is overlooked, but it shouldn’t be because it’s excellent. It’s a blade-style trigger, and the pull on my sample averaged two pounds, 10 ounces with little pull-to-pull variance and a crisp, clean break. Because the pull weight was a bit below Mossberg’s published specs, I checked with Mossberg to see if the Precision comes with a special LBA installed, but Blazek told me it’s the same LBA you’d find on any MVP rifle. The Luth-AR MBA-3 stock permits adjustments for length of pull, cheekpiece height, cast and buttpad height. There’s also a rail section at the bottom. One thing you may not like about the MVP Precision is the safety, and this isn’t Mossberg’s fault. The MVP action employs a two-position rocker on the right side, just behind the bolt. That’s fine when the rifle wears a hunting-style stock, but in a chassis setup you’re simply not going to be able to operate it with your hand in a firing grip. It’s not like Mossberg has a choice here, and it doesn’t take long to get used to reaching up with your right hand to operate the safety. 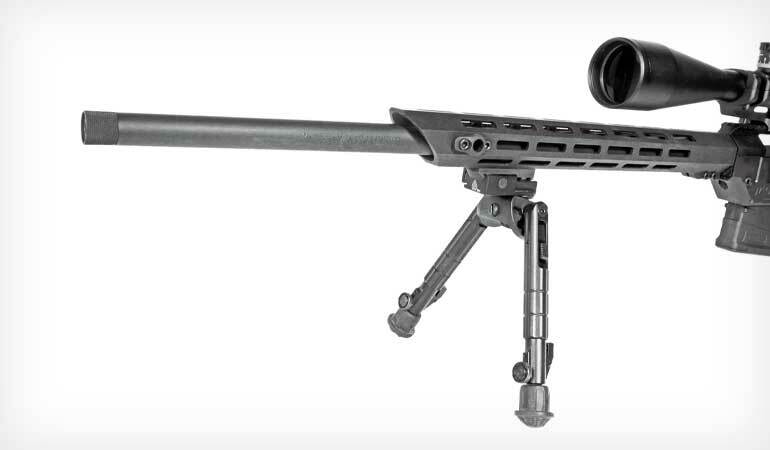 The free-floated barrel on the 6.5 Creedmoor is a 24-inch medium-bull, and it’s threaded 5/28x24. While I gigged Mossberg for not including a rail section for the fore-end, I think the company was smart by not including a muzzle device. Shooters who like brakes are pretty particular about what brake they use, and nowadays plenty of competitors are using suppressors. 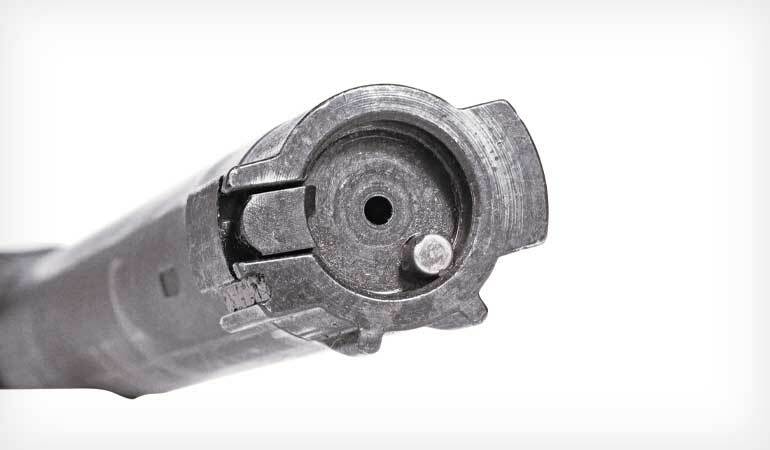 So it makes sense for Mossberg to keep costs down by skipping the muzzle device instead of hanging something on the end of the barrel many buyers would not want. For testing I installed Nikon’s Black FX1000 front-focal plane 6-24X in the company’s Black Cantilever one-piece mount (see the review of the optic elsewhere in this issue). I’ve reviewed a number of Mossberg rifles over the years, and I’ve never been disappointed in their accuracy. The MVP Precision was no exception. Now, you may look at the accompanying accuracy chart and think, “Meh.” But here are two things to consider: One, those are five-shot groups, and two, the barrel was not allowed to cool between groups—just between ammo types. The groups weren’t fired super rapidly, but I didn’t dawdle, either, because I wanted to see how well it would maintain accuracy as the barrel heated as it would during a match. With the SIG and Federal loads there was almost no difference between the first and the last group. With the others the average was a 0.3-inch gain from first to last. That’s solid performance, especially for an economical rifle. Best single group was a 0.62-incher with the American Eagle load. Mossberg provides a QD pocket on the fore-end, but you’ll have to buy your own rail section or an M-Lok bipod to get the gun ready to roll. On a second range trip, I went to work on steel plates out to 800 yards with a Leaper’s UTG bipod attached, and the Mossberg did its part when I did mine. It took no time to set it up like I wanted it. On still another outing, I brought along a friend who was thinking about taking up long-range shooting. He likewise had no problems setting up the rifle to suit him, and he’s a really big guy—whereas I am not. The MVP Precision isn’t perfect, but it does deliver as promised. Regarding price, I did a bit of surfing and found street prices for the rifle were hovering just above the $1,000 mark—plus, again, the availability of inexpensive magazines. These upfront savings are important because you still need to buy a scope, mount, ammo and all the accessories the precision long-range game requires.